It’s August 24, 2014 and I don’t know where I’ve been at the end of every August, but I believe that more than 90% of the time I have been in California. August in SoCal is hot. Just now I checked the weather and it’s 85 degrees in Santa Clarita. 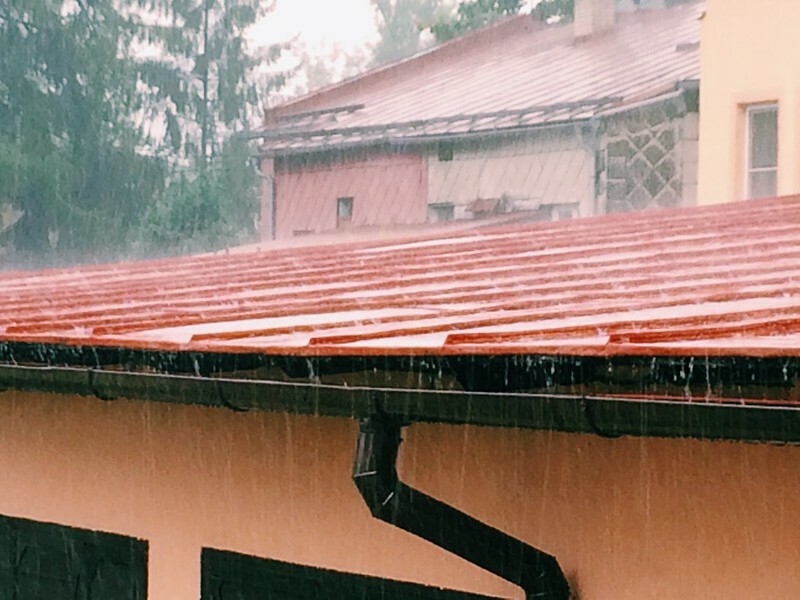 But you wouldn’t have had any idea it was August here in Czech today. The high was 60 and right now it’s in the upper 40s. It rained most of the day and at one point it was just coming down hard (photo below). It cleared up tonight and Titus and I went outside to play for a bit and I said to Bethany that had I not known it was August I would’ve thought it was November. I had a sweater and pants on and found myself trying to see my breath. All that to say I’m starting to get a little nervous about the winter here. If August is more like November where I’m from in California, then what must November feel like? I’m sad we weren’t able to go to church today. Bethany really didn’t feel well today and even though I had gotten up and showered, I knew Bethany wasn’t well enough to go. And the thought of taking both of my kids to a two hour Czech church service by myself was a little daunting so I spent the morning with the kids while Bethany rested. I’ve noticed we have good days and bad days with our health and I wonder if our bodies are just adjusting. Already I can tell my allergies have been a problem and numerous days Bethany and I have had weird headaches. Not sure what that’s all about but I hope it’s not a long term issue. We are nine hours ahead of California and we read online today the news as it was happening regarding the 6.0 earthquake in Napa. From what I saw there were some serious damages and apparently critical injuries. We will be sure to pray tonight for that area. Often when big events like that happen it’s an open door for churches to give the gospel and share the love of Christ with their neighbors. By God’s grace, He will even use an earthquake to draw more to Himself and that is our prayer. Tomorrow morning I’m headed out early with a translator and our landlord to finalize some paperwork regarding our electricity and gas. Please pray it goes well because historically anything at an “official” office doesn’t go smoothly. That’s just life in Czech.